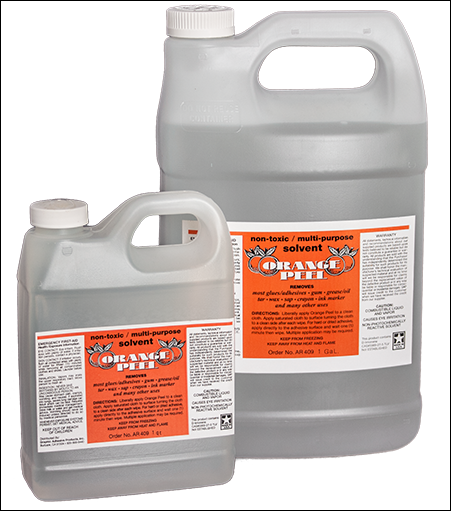 Orange Peel Adhesive Remover This product, is a natural citrus based solvent, developed for the removal of oil and water based adhesives, wax, tar, oil, chewing gum and ink graffiti. May be used on automotive, boat, glass, acrylics, metal, masonry, cloth / vinyl fabrics and many other surfaces. This pleasant smelling BIO-DEGRADABLE FORMULA, CONTAINS NO TOXIC PETROLEUM DISTILLATES, NO CHLORINATED HYDROCARBONS, NO ALCOHOL, NO ETHYLENE, NO CAUSTICS, NO ACIDS OR OLLUTION-CAUSING INGREDIENTS. NOT for use on styrene plastics. When using on sealed masonry surfaces; test on an inconspicuous area to make certain it will not remove sealant.